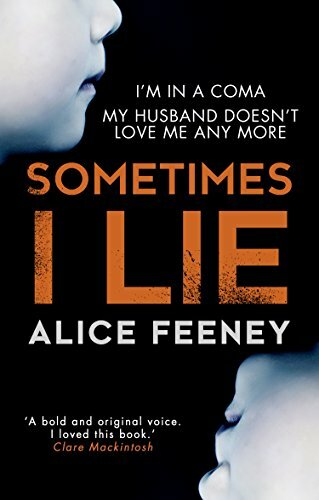 Sometimes I Lie is a psychological thriller from debut author Alice Feeney which seriously messed with my mind. Amber Reynolds is our main character and, as the book cover says, she is in a coma following a serious car crash. Although she is in a coma, she is very aware of her surroundings and can hear what is going on round about her. She can’t quite remember though what happened to put her in hospital and can only start to piece it together from what she hears the medical staff and her visitors say. Amber is that fascinating kind of character, an unreliable narrator as her memories start to come back piece by piece. While she is in hospital, the chapters are headed ‘Now’. We also have chapters about ‘Then’ following Amber in the few days leading up to her accident and I have to say I really didn’t like her at all! You see, another reason that Amber can’t be trusted is that she freely admits that she lies. Doubly unreliable then. Just to add to the intrigue, there are diary entries from ‘Before’ when the reader learns more about what was going on in Amber’s childhood and I have to say the diary entries don’t portray a particularly likeable or reliable narrator either. So throughout the book, you are really not sure what you can believe and what is the truth. And that is what makes it such a page turner. Add in lots of twists and turns and your head will be spinning too! There was one particular point in the story when I suddenly realised just how cleverly Alice Feeney has written this book and that I had been reading it all wrong! From that point on, I read with very different understanding. Or so I thought, until the author proved me wrong once again. Sometimes I Lie is a completely gripping thriller which will have you compulsively turning the pages trying to figure out just what is going on. It will take you by surprise so many times with clever twists and turns right up to the very last chapters. Sure to be a big hit this year. I think I’d enjoy this one! Don’t understand the ending can anyone explain about the braclet . who left it ? Gosh it’s been so long since I read it, I can’t remember the details. I’ll see if I’ve still got my copy and have a look.